Integrity Selling® is a customer-oriented, needs-focused sales training curriculum that redefines the sales process to focus on identifying and meeting customer needs and creating value in every transaction. Participants learn values-based principles of selling and communication as well as a unique sales model. This program has been proven in hundreds of organizations as a tool to increase sales, develop more professional sales teams, and decrease the high costs of turnover. Available in seven languages, no other sales training is in its league. Approach... to gain trust and rapport. Interview... to identify and understand needs. Demonstrate... to show how needs can be filled. Val-I-date... to prove your claims and heighten trust. Negotiate... to resolve problems that prevent someone from buying. Close... to ask for a decision. The width of the bars in the graph shows approximately what percentage of time each step should take in the sales process. Furthermore, each bar indicates how much time a sales person should be listening (black) versus talking (red). 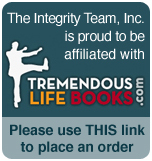 Integrity Selling® is designed to produce lasting behavior change. After participants are introduced to the sales process in an initial six-hour training session, the concepts and behaviors are then reinforced over the course of eight weekly follow-up sessions. This follow-up format ensures lasting results and continued growth. Integrity Selling® can be implemented by The Integrity Team, Inc. or we can certify your trainer or sales manager to conduct the program. Selling is an exchange of value. Selling is not something you do to someone, it's something you do for and with someone. Understanding people's wants or needs must always precede any attempt to sell. Develop trust and rapport before any selling activity begins. Selling techniques give way to selling principles. Integrity and high ethics are accepted as the basis for long-term selling success. A salesperson's ethics and values contribute more to sales success than do techniques or strategies. Selling pressure is never exerted by the salesperson. It's exerted only by prospects when they perceive they want or need the item being sold. Negotiation is never manipulation. It's always a strategy to work out problems ... when the prospects want to work out the problems. Closing isn't just a victory for the salesperson. It's a victory for both the salesperson and the customer. In order for a person to be highly successful in sales, there are five dimensions in their life that must be in congruence with each other. These areas include: view of selling, view of abilities, values, commitment to activities, and belief on product. Integrity Selling® helps bring these dimensions into congruence so people feel freed from inner conflicts and are able to increase their achievement drive and overall performance. Have specific goals or objectives of what you want to sell, earn, accomplish, gain, achieve, or possess. The more clearly defined a goal is and the more focused a person is on achieving that goal, more effort, energy, and achievement drive will be released to accomplish it. Have a clear mental target. When goals are clear and written they are usually realized. Achievement Drive is the desire or drive a person has toward the attainment of goals. People with high Achievement Drive usually will bring more effort, energy, creativity and enthusiasm to their personal and professional lives. Achievement Drive is released from within an individual, rather than poured in from the outside. Achievement Drive can be increased. Emotional Intelligence is the ability to monitor and understand one's own emotions and to act wisely in human relations. It is emotional stability and steadfastness. Emotional Intelligence defines a person's ability to work well with others, deal with problems and ambiguities, stick to the tasks, be self-motivated and remain optimistic about work and life. High Emotional Intelligence gives a person stability, stick-to-itiveness, and mental toughness. E.Q. is usually more important than I.Q. in attaining "Success in Life." Social Skills refers to the ability to move in and out of different situations and interact with different types of people with grace and ease. It is the ability to ask the right questions, listen to people, gain rapport and put them at ease.